Small Edwardian bureau in solid oak. Original handles and key. Newly revarnished and in excellent condition. 98cm high, 62cm wide and 39cm deep. A looked after piece of furniture, beautifully made. 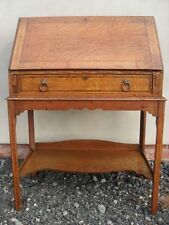 Pretty Ladies Edwardian writing desk/bureau. Shabby chic. Fully usable as a writing desk. Stencils to the desk drop and underneath shelves. This would look lovely in a corner of a lounge and is slim enough for a hallway or even girls bedroom. Antique Edwardian Inlaid Bureau. Good condition. Fall down front shelf with 2 small drawers inside along with dividers, 3 drawers to front, brass handles. Height = 38” Width = 24” Depth = 16”. Collection in person only. Two Small Drawers and Pigeon Holes. With Fall Flap. : 24.75ins wide, 14.5ins deep, 29.75ins high to the fall flap desk, 42.5ins high overall. It is slightly wobbly, which might be due to what appears to be a previous repair to the back right-hand side leg (see pictures of crack). There is plenty of free parking & access is through a drive way on rear of property. Presented for sale is a solid oak Edwardian Bureau. It will last for years with it’s strongly built solid hardwood construction. Depth - 450mm (17.72"). Length - 690mm (27"). 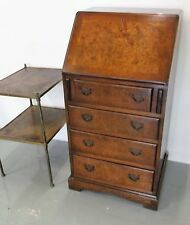 Solid oak leather writing desk/bureau. From early 1900's. Two large drawers and leather inlay desk. Small inside 'cupboard' is lockable with key. Sorry don't know much about it as not a dealer, just appreciate nice furniture. Overall - 71.5cm high, 172 cm long (open), 57cm long (closed), 127cm deep (to maximums). This lovely Georgian table dates from the first part of the nineteenth century. It is constructed from solid mahogany and is very heavy. With inlaid fall front above two panelled door cupboard and standing on half-moon bracket feet. Dating from circa 1905. Wear and marks to the top. Width: 66cm. (busy periods may take longer). The fall opens and closes with a retractable / sliding interior of drawers, pigeon holes and letter racks. DEPTH 49cm. If you would prefer to collect yourself that is fine by us. Reference# 6223. FLOOR TO FALL WHEN OPEN 70cm. This is a beautiful early 20th century mahogany desk in the Georgian style. This item is virtually unmarked as the pictures show. Height 77cm. Upper section with moulded cornice, 3 fitted shelves enclosed by glazed panel doors with antique white painted interior. This is a solid antique piece of furniture and has knocks and scratches as would be expected for an item of this age. Very Good mahogany Bureau with blind fret decoration good condition for age the measurements are 30 inches wide x 39.5inches high x 16.5inches deep . WE ARE OPEN FOR VIEWINGS & COLLECTIONS. Our 1800 sq ft unit is based on a small industrial estate, close to Peterborough City centre, there is free parking right outside our unit. Help is always on hand for the loading of your item if required. Adjustable shelves in top section. You can arrange viewing by -. Nice original condition. I cant find a makers mark but its quality. Initially thought is might be from Liberty's! The table is an envelope table, with the four corners folded in when closed. The table has lovely satinwood inlays, and has a single drawer to the front. Lockable inlaid. Brass all complete on scrolled legs. Pretty Antique Circa 1900 Bleached Oak Coal Purdonium. and bleached to a lovely natural dry oak finish. Constructed in solid oak with gorgeous well carved decoration. or magazines. New listingGREY PAINTED/ DISTRESSED EDWARDIAN BUREAU THREE DRAWERS AND DROP DOWN DESK. GREY PAINTED/DISTRESSED EDWARDIAN BUREAU THREE DRAWERS AND DROP DOWN DESK. STENCILLED OAK LEAVES ON LID AND DRAWER FRONTS. BRASS HANDLES BLUE PAINED LEATHER INTERIOR WITH COMPARTMENTS AND TWO SMALL DRAWERS. QUEEN ANN LEGS. SOME SMALL MARKS ON INSIDE LID. (See photos). Small piece missing on lid. Not very noticeable. With a bit of tlc this will be a very nice piece of antique furniture. Hand scraped and Bleached with Paint Effect Finish to Resemble Drift Wood. Wonderful Fun Desk with Beach House Appeal. Drop Flap Writing Surface with Fitted Interior. height of flap when down 70. Over 3 Long Drawers with Brass Handles. This dates to circa 1900 and it is after the Georgian designs. At the bottom there are a number of large drawers. INLAID TOP WITH BRASS GALLARIED SURROUND. PLUM PUDDING VENEER ON CYLINDER. SATINWOOD INTERIOR DRAWERS. It has two manual loafers which support the drop down flap. Inside, is a tooled leather writing surface, plus pigeon holes & one small drawer. Wales & Scotland may be a bit more. However, you will be responsible for the cost of transport both ways. When the leaf is down, the depth is 71 cm and is 72cm from the ground. It has a pierced brass gallery back over fall front opening to fitted interior, over single frieze drawer raised on square tapered supports united by shaped stretchers. Small antique Edwardian inlaid bureau,having a fall down front with shell inlay and satinwood crossbanding, fitted interior,four long drawers crossbanded in satinwood original brass handles,raised on original bracket feet. The main drawers below all run smoothly and fitted with original brass swan neck handles. Depth 51 cm. In excellent original condition. Height 203 cm. 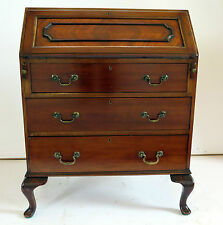 Edwardian mahogany desk slope large writing box in the style of George II. Beautifully painted floral panel on slope. At the very top of the slope is 8" or 20 cm. The slope folds down to sit on pullout rests for writing. The corners are curved & the sides actually slant back into the middle. There’s a single drawer below with original brass handles & pull out loafers either side of the drawer to support the writing surface. Beautiful antique desk or sideboard. The fall front is also magnificently inlaid and once opened it reveals an internal central cupboard door, four small oak lined drawers with brass handles and three pigeon holes. The lower section has three oak lined graduating drawers with the original brass swan neck handles. Small french style shabby chic writing bureau. Half finished renovation project. In good condition. Dimensions: H: 99cm W: 61cm D: 41cm Have listed this item for collection only but can arrange delivery by courier. Just ask and I can get a quote. Fitted interior. 2 part for transport. Substantial wide size. Astragal glazed doors each with 13 individual glass panes. Inlaid boxwood stringing and mahogany crossbanding. Shaped bracket feet plinth also inlaid to match. Solid mahogany groundwork and sides.